This is how the world ends. The red eyes of a stone saviour's statue stare down at a city in chaos. Emergency sirens shriek through the hot Armageddon night. A New World Order ushers Earth into damnation. The heretics from White House Farm have brought the apocalypse upon us. 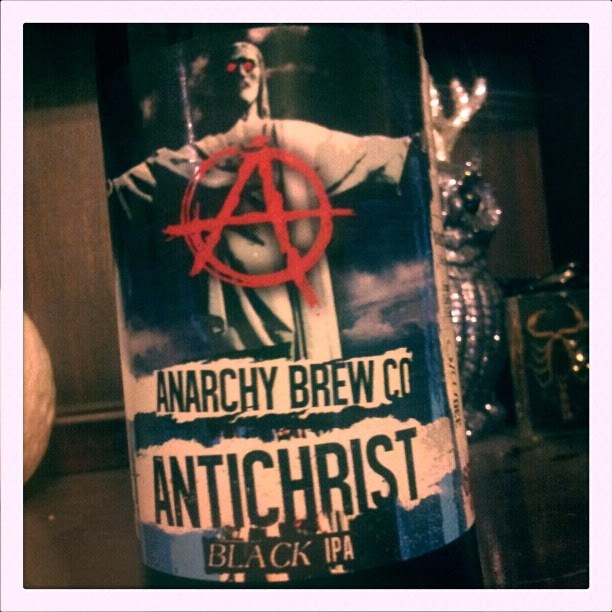 With a label that promises the End Times, Morpeth-based Anarchy Brew Co's Antichrist Black IPA sets a hard target for itself. A beer named after the end boss of Christianity needs to be a towering thing, a fork-tongued civilisation-ruiner of a beer. Jesus Christ I am so sorry. With the final seal imprisoning the despoiler opened, a scent of tortured and charred lime seeps from the neck, preceded by the faintest and weirdest hint of mint, which vanishes almost instantly, as if the Great Deceiver has just chucked a Satanic mojito down his infernal neck before clocking on for the end of the world. There is the scent of green fruits and greener weed, tortured with fire and melted alive. The pour is blackish, reddish, purple, cycling quickly through the stages of a bruise as it fills the glass for a 3/4 inch of cratered foam atop a black lake. Pomegranate, grapefruit and lychee scents ascend rapturously from the foam to the nose, bitter and pointed. The first taste is of dark malts, not the fruit explosion this reporter expected. Pine needle sharpness soon overrides the malt flavour in the immediate taste, though the aftertaste remains dominated by malt and a rising susurration of coffee. The mouth is soon coated, sticky and gummed with the claggy blackness of Antichrist, and holding in a mouthful for inspection sees the flavour strip down to hoppy bitterness and sappy, piney tree-taste as the other notes die away. 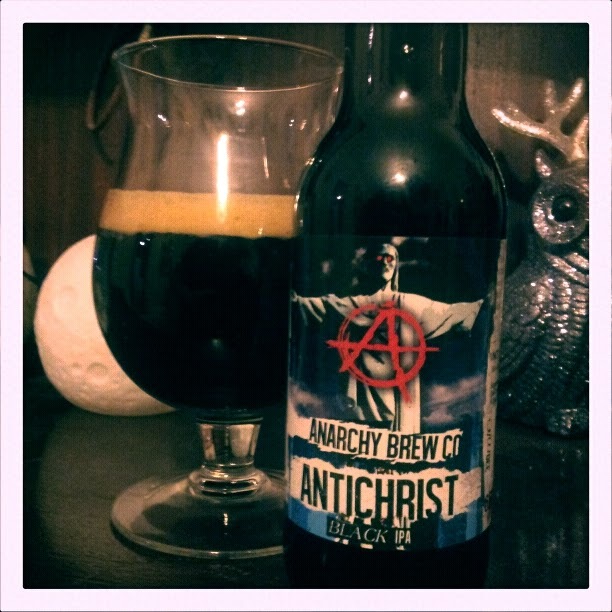 Antichrist is, naturally, 6.66% abv and, as befitting the Father of Lies, really doesn't taste that strong. A head-warming quickly comes after doing away with half of the bottle, as the nature of the Beast becomes apparent- the fires of Hell concealed behind a slick smile. 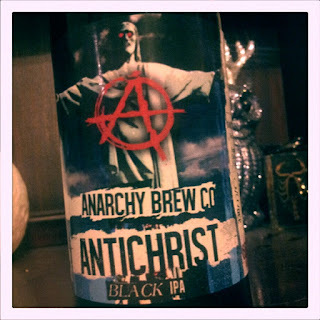 One feels possessed to drink Antichrist quickly, its flavour piling on layers of delicious fecundity glug on glug. All too soon Antichrist is a small black pool at the bottom of the glass, a thin layer of foam still persisting as His Satanic Majesty's clock runs out. The final scent is that of a burned-down gingerbread house, the final taste the gushing lifeblood of a pine tree as the flavour becomes entirely sap. For now, your correspondent has destroyed the Antichrist. He is confident that this delicious battle will be repeated, week on week, until the seventh trumpet sounds.